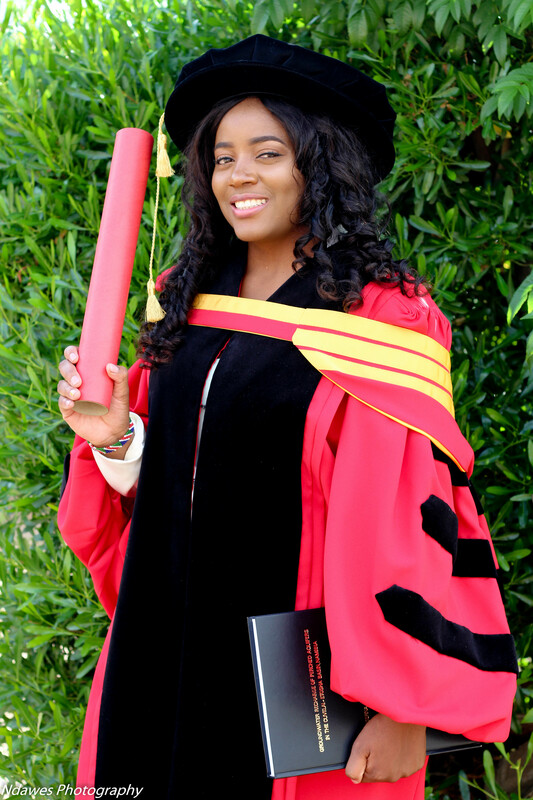 Dr Josefina Hamutoko is a 28 year old PhD graduate from the University of Namibia (UNAM). She is the 2016 Young Scientist of the year, awarded by the National Commission on Research Science and Technology (NCRST) and first PhD in geology graduate from UNAM. She has received numerous grants and scholarships which has allowed her to further her studies and presenting her results at international conferences. She has 11 publications in academic journals and she is a reviewer for several academic journals. This young researcher is proving to the world that women have got the capabilities to excel in the science field and more. 1. Many who have read your interviews in other publications know you as one of the youngest Namibian PhD holders; please can you tell us more about your upbringing? I grew up in the northern part of Namibia, I think when you have been to UNAM and other institutions of higher learning in our country, you will realize that most students are from the northern regions. Perhaps this is because the main population is from there. My family helped a lot to be where I am today, most especially my mom. My mom is a teacher, she was my grade 1 teacher, and she did not only teach me how to write letters but she has also been a strong role model for me. I started school quite early, I was 5 years old when I started grade 1. I started school early because at that time I did not have anyone to stay at home with as my mom was busy with her work and the education system was not so strict especially in rural areas. What has shaped me is having that consciousness to make the best use of every opportunity I get instead of letting it go to waste. If you have registered for a course, the main goal should always be to finish what you have signed up for. I also have good examples in my family, for example, I remember seeing my aunt growing up, going to nursing school and really seeing her life transform in a very positive way because of her education. This also taught me quite early on the value of education. 2. Most people complete their post graduate education and seek employment immediately after, what prompted you to carry on with your studies to PhD level? I was looking forward to getting a job even before completion of my MSc studies. I remember when I was in fourth year Professor Benjamin Mapani said I should become a tutor. To which I refused because I did not want to become an academic. But it seems that is not the plan God had for me. Before I completed my MSc studies, Dr Wanke asked me if I was interested in working on an upcoming project. The offer came before I finished my MSc. After completion of my MSc studies, I tried looking for a job; probably I did not try hard enough because I already had the scholarship offer. When I spoke to my family and friends seeking advice on whether to go for the project or continue seeking employment, I was advised to accept the scholarship. I was getting a stipend from the Project (SASSCAL, funded by Germany) which was enough for me, not necessarily comparable to my peers with a Masters of Science degree, but I could live on it. My family and friends made me realize one thing; I was getting paid to go to school. I remember my aunt once commenting “You know people of your age are only doing their first degree now, what would it take from you if you just continue with your studies”. That is how I ended up furthering my studies. 3. Doing a Masters degree alone is challenging, because sometimes reviews from supervisors may be difficult to work through and may sometimes not be very uplifting, how different was your PhD research experience compared to the Masters research? I did my MSc by course work; that is a different aspect when you do an MSc by thesis and course work. In the course work, you only do research in the last 6 months and the level of research is not as intense as when you do the MSc by thesis and course work. For example, if you do it at UNAM they have different grading requirements, including the number of pages expected from a student and the quality of content. It was not so comparable to the PhD, because at PhD level it is entirely just research. Of course you have good and bad days. In MSc you learn the basics of research and at PhD level you have to apply what you have learned over the years. Of course you have a supervisor, but you are really on your own. I did my masters in Germany, comparing the education system to UNAM, I would like to applaud UNAM for the work they have done in my undergraduate studies. Most of the content I did in the MSc level in Germany was not new to me because I had already a basic understanding, which made me realize the good quality of UNAM’s education. The teaching methods depend on the lecturer, but overall it is not completely different from UNAM. When it comes to research at PhD level, what is different is the fact that you have more people enrolled for PhD studies in Germany. It is normal for people to enrol for full time PhD, while at UNAM there are not a lot of full time PhD students. It is an uncommon thing. I remember people were always on my case asking me why I was doing my PhD studies instead of just getting a job like most people do. Someone actually said this to me “Do you think you are special, why are you just studying instead of working and study part-time like everybody else?” What people don’t realize is that most people doing PhD on part-time are forced by circumstances and if they were to get an opportunity to study full time, they would definitely go for it. 4. What challenges did you have to go through as you were working on your research work? As you might have heard that I am the first one in the geology department to graduate with a PhD. You don’t have other people at the same level. Eventually some of my colleagues started, but before that, I did not have a support system from peers on the same level who would understand what I was going through. But I would like to acknowledge my German colleagues and my friends as they have been my support system, always there to listen and motivating me. What I have seen at other universities that could help PhD students at UNAM is hosting seminars where students would catch up on their work. I don’t know if other departments/faculties are doing this. In the geology department we do not have a lot of PhD students, what would help is hosting a seminar for the whole faculty of science where every week or every second week one PhD student would present their progress report. It helps students to stay motivated, stick to their work/time plan and also get comments that may really help them in their research. At the moment, you are all alone and you have to be very self-disciplined else you don’t finish. I am thankful for my supervisor; she has really been helpful, though she was very busy with so many other projects. 5. What advice would you give to people doing their masters right now and are not sure whether to carry on with their studies to PhD level? The best thing to do would be to follow your heart and do what you think is right for you. There is no pressure, not everyone needs to have a PhD. It doesn’t also mean that you don’t enrol for a PhD if that is what you really desire. I remember attending a workshop for early career scientist at a conference and one speaker said “we should follow our dreams, but we shouldn’t also close our eyes to opportunities that are available”. Just because you wanted to be the best mine geologist and then all of a sudden there is no mine looking for geologists, this does not mean you cannot become a good geologist in another field. Therefore, just follow your heart, be open to other opportunities and do your best at whatever you are doing. 6. In terms of academic qualification, you have attained the highest level and you are only 28! (Awesome!) What is next on your to do list in terms of professional development? I am trying to get a job, I need to put the knowledge I have learned into practice and get experience while working on my long-term career plan. I think in terms of career development it depends on the type of job one gets. Because that plays a major role on the choices you make to improve yourself. For example, if I go into academics, then I will need to do more research and get more publications. If I go into the industry, then I need to do more management and leadership courses to be able to keep up with the job. I don’t really have any specific plan yet. Obviously once I get a job, I will do whatever will advance me in my job and long-term career. 7. What is your advice to young women who are afraid of being labelled “too educated” for the fear of not finding husbands, because there is still slight perception that a woman should be less smart than her husband? I remember end of 2013 I was chatting to a lady who told me I will not get a husband if I do a PhD. She advised me to first find a husband before enrolling for my PhD studies. Of course I am still not married so I don’t know what will happen in that line..hahaha. But I think any man who is scared of an educated woman should not be considered for marriage. Education should not determine your marital status. There is no guarantee that if you don’t study you will get married. Imagine now you don’t study and you end up not getting a husband, you will then be saying things like ohhh I wish I had gone to school. I don’t think it is right to teach young girls that kind of perception. Let them study and become independent. Education should not be the reason why someone cannot marry you, else they should not even be considered for a husband in the first place. We need to focus more on changing the mind-set of young men, why should they be intimidated rather than inspired? If they accept educated women more, then young girls will never have the fear of going to school because they are afraid of being alone.